Best $10 I’ve spent in a good long while? 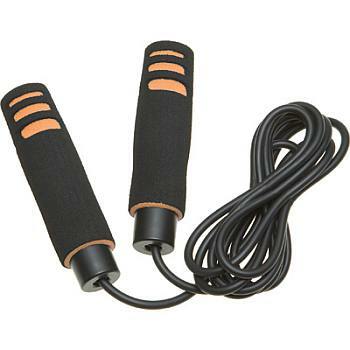 A jump rope. I spend so much time sitting or standing in one spot, whether I’m painting or packaging orders or making jewelry, that it’s about time I got some exercise. I walk the dogs every day, but my pooches are both senior citizens, so that’s verrrrry slow going. I like to play tennis, but it rains so much in Vancouver that I can hardly count on that as a way to get in a daily workout. I’ve started several exercise regimens where I promised myself I’d take up running or roll out the yoga mat in my living room every morning and nothing ever seems to stick for very long. Hopefully something simple like a jump rope will do the trick! I initially figured I’d do 15 or 20 minutes once a day, perfect little break in the middle of my work day without really having to change my clothes or go to a gym. Ha! It takes me all of about 2 minutes to be totally winded. And yes, I am embarrassed by how out of shape I’ve become. Seriously, when did skipping get so hard?? New plan? Only a few minutes at a time, but 3x per day. It will be great to get my heart rate going every day & will hopefully boost my energy levels too. Now if I can set up a rusty weight bench & punching bag in the back yard, my ghetto fabulous gym will be complete!